Caliper, Fork, Turn-signal or Engine Guard Mounts! RG-1834: This elegant Mount Kit replaces the Original Equipment turn signal mount, and positions the Reflector LED Fog Lamps and turn signals close to the fairing for a custom look. Show Chrome or Gloss Black Mount Kit. Installation provides a supplemental pool of light in front of the motorcycle. Add a clean, uncluttered look to your bike's profile. Includes left and right mounts and all required hardware. 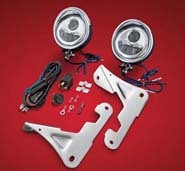 Requires separate purchase of Chrome DL-090 or Gloss Black DL-092 Reflector LED Fog Lamps. 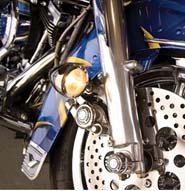 Fits '15-later Road Glide® models with Original Equipment or accessory bullet turn signals. Requires separate purchase of Reflector LED Fog Lamps. CR-1P, CR-1B & CR-1T: The patented design provides a low profile, durable housing with high performance LED lighting. 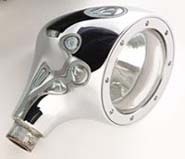 Products are made with hand polished 316 Stainless Steel. Utilizing industry leading LED chips to provide high output and power efficiency. The wrap around design enables a true fit for extraordinary resistance to the elements while adding a cutting edge, decorative and functional addition to any tube application. Facilitates heat dispersion through the attachment area enabling high output in a low profile format. Offered with 1.25” diameter with cool white, amber, red, blue and green LEDs. Available in mirror polish, black powdercoat and textured black powdercoat. Wires are run inside the bars for the ultimate custom installation look. Kit comes complete with housing, screws, lights, wire, and LED boards. The days of gluing cheap led strips to your prized possessions are over. Seeing a valuable piece of machinery such as a motorcycle with hanging wires and plastic glue on LED strips does an injustice to the look you are trying to achieve. Default LED color section is clear. 5035: New L.E.D. 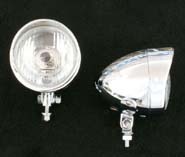 Lamps are a direct replacement for the Halogen Lamps included in our 3” driving light kits. Enjoy long life, lower operating temperatures, reduced draw, & color/brightness that closely matches our Phase 6 & Phase 7 L.E.D. headlamps. Replaces H3 Halogen Lamp Assembly in 3” Driving Light Kits (pr). 7748: One of the year’s most popular products! Our L.E.D. Halo Headlight Trim Ring adds incredible style with it’s grooved trim, easy installation, & low draw on your electrical system. Night or day, this product is eye catching & adds much-needed style to your lights. SM-58: See your ride in a whole new light with this aggressively styled halogen driving light kit that gives traditional batwing fairings an entirely new personality. Compact, stretched bezels and stylized fully adjustable brackets provide a clean, stiletto-sharp look with intense, focused illumination. 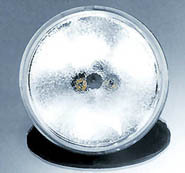 The H3 Halogen lamps offer significantly enhanced light output. Take the brightness level up a notch with available L.E.D. lamp upgrades, sold separately. Chrome. Fits 2014+ Electra Glide & Street Glides. SM-59: Similar to above but in gloss black. 312L: eGlideGoodies introduces a driving light kit for the 1996 and newer Harley FLH that mounts to the turn signal bracket attached to the front fork. The Show Chrome Accessories steel mounts come with a complete wire harness with relay switch toisolate from the FLH’s electrical systems. This driving light kit is available with 3 ½’’ LED High Intensity Lights. This same market leading housing is available in LED version which has dual high intensity LEDs in each driving light. Designed to fit Harley FLH 1996 and newer. 2262: Low draw, high power, & just flat out awesome. These L.E.D. Passing Lamps are the ultimate lighting accessory providing a bright white light that’s the closest thing to sunlight & a perfect match for the 7” L.E.D. Headlamp. Sold individually. 2247: 4-1/2" Passing Lamps. 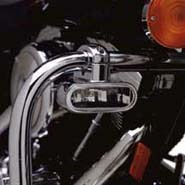 Fits: ’05-’12 H-D Models with 4-1/2” Passing Lamps (pr) Note: Can be used on ’04-earlier Models but requires separate purchase of two H-D Adapter Harnesses (H-D P/N 68355-05 (ea) Fits Electra Glides, Street Glides, Road Kings, Trikes, FLST Models with 7” Headlights & Dyna Switchback (ea). BB-101: 3-1/2", 55w Halogen Light Kit. For Victory Cross Country, Tour, Magnum 2010 to current. BB-101L: Similar to above but in LED. BB-102L: Mini LED. For those that want a more compact driving light kit for the Victory Cross Country and Magnum models, we offer 2 3/8’’ Mini Driving Lights with its Victory Cross Country light brackets. The 2 3/8’’ Mini Driving Lightsare die cast and have a visor shaped bezel. The light is 3 ¾’’ long and is offered in either a 50 Watt halogen or 400 Lumen/4000K LED. The non-dimmable LED works great with all non RF broadcasts such as Sirius/xm, bluetooth, etc. For the VictoryCross Country, Cross Tour and Magnum 2010 and newer. Fits Victory Cross Country Tour, & Magnum 2010-. BB-102B: For those Victory Cross Country riders that want to keep it dark, we now offer Halogen Driving Light Kits in a black satin finish. These compact driving light kits fit the Cross Country, Cross Tour, and Magnummodels and include the lights, the mount, wiring, and an isolation relay to protect your bike’s electrical system. The halogen delivers 50 watts from this compact 3 2/8’’ x 3 ¾’’ visored die cast light. Both the lights and mounting brackets are finished in a deep black satin finish for that blacked out look. 2 3/8" BLACK DRIVING KIT, 50 Watt Halogen Light, For Victory Cross Country, Tour, & Magnum 2010-. BB-102LBK: Similar to above but in LED. The high-output, high intensity Litespan LED delivers 400 Lumens from its compact 12 volt 7 watt 6 LED output in a bright white 4000Kcolor. BB-364: New MR16 high-output and high-intensity Litespan LED 2 3/8’’ Driving Light Kit is available in a universal cruiser fitment. 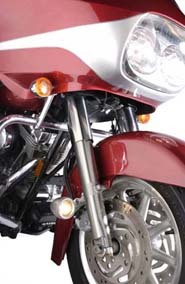 Custom die cast aluminum lights and fork mounts make an ideal fit on many cruisers, such as: Harley Dyna models, pre-2000 FXR, XL Sportsters, FXS, FXDWG. The Litespan LED reflector bulbs produce 400 lumens each from 7watt 6 LED output in bright white 4000k color. Their concentrated 20° beam angle puts more light down the road in front of you for a true driving light function. 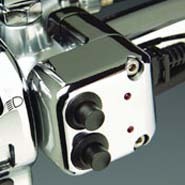 The die cast clamps fit cruisers with 38mm to 41mm forks and comes with a wire harness,relay, and switch. Requires a Wiring Relay Kit (P/N SK-202 sold separately) for proper installation. Fits 2010+ Cross Country, Cross Country Tour and Magnum Models. SM-62: Similar to above but in Satin Black. These Motolight Caliper Mount Halogen Running Lights are designed for the Electra Glide, Road Glide or Road King with dual front disk brakes. Utilizing a caliper mounting bolt hole, the bracket is attached with the supplied zinc plated, grade 12.9 socket head cap bolt. The replacement bolt has an additional length to accomodate the bracket and maintain full thread engagement. Bolts must be torqued to the Harley-Davidson factory recommended torque setting. An excellent touring and safety accessory upgrade. The supplied harness plugs right into the H-D aux switch. Easy installation! Replacement 35 watt, 50 watt and LED replacement bulb kits available; includes 2 bulbs, 2 gaskets and 2 O-rings. BB-365: These die cast 2 3/8’’ visored Mini Driving Lights come with a 1 ¼’’ highway bar clamp to help light up the road for increased visibility. Complete with wire harness and isolation relay to protect your bikes circuit along witha choice of two style of switches. Available in either 50 watt halogen. BB-365L: Similar to above but in 7 watt 400 lumens/4000K LED choice. 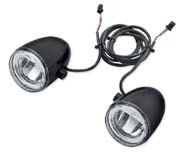 DL-20-125: Increase your motorcycle's visibility with 2" 55-Watt Halogen Driving Lights Kit. This compact set of driving lights can be mounted to engine guards, handlebars, inside fairings, or on a light bar using the 1.25" clamps. Chrome plated steel housings, 55 watt halogen sealed beam bulb, and swivel mounts with 6mm bolts. Kit includes lights, 1 1/4" clamps, switch, relay, all wiring, and simple to follow instructions. 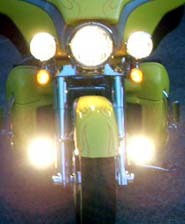 DL-20: Increase your motorcycle's visibility with 55-Watt Halogen Driving Lights. This compact set of driving lights can be mounted to engine guards, handlebars, inside fairings, or on a light bar using any of our P type clamps. Chrome plated steel housings, 55 watt halogen sealed beam bulb, and swivel mounts with 6mm bolts. This set of lights, while small, deliver an amazing amount of light. 2.5” (front to back), 2.5 diameter, 4” tall (sold in pairs). EM-19: If you ride at night, these are a must have. Featuring 3” DOT approved lights & 1-1/4” clamps, they bolt on with ease & have what it takes to penetrate the darkness. Wiring & adding a switch is simple with our Wiring Relay Kits (P/N’s SK-202 or SK-328, Sold Separately). Universal for mounting on 1-1/4 inch Engine Guards (Mount above, below, or anywhere on bar with 1-1/2” of straight engine guard. Clamp & lights rotate for limitless adjustment). EM-19LED: No hassle L.E.D. upgrade! Direct replacements for the Halogen Lamps included in our EM-19 3” driving light kits. Enjoy long life, lower operating temperatures, reduced draw, & color/brightness that closely matches our Phase 7 L.E.D. Headlamps. 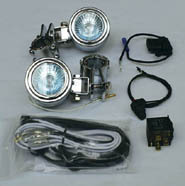 Replaces H3 Lamp Assembly in EM-19 Series 3" Driving Light Kit. 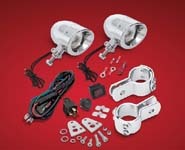 EM-05 and EM-20: These Engine Guard Mount Halogen Running Lights can be installed just about anywhere. They include mounting bolts. Our P-Clamps work great to attach to standard 1.25" engine guards. They are assembled with high shock, heavy duty single filament quartz halogen bulbs. These lights have a single power wire and ground through their mount. Small Silver Bullets measure 21/2" x 1-5/8". Large Silver Bullets measure 3-1/4" x 2-5/16". When using the Engine Guard Mount Lights as additional driving lights, we strongly recommend wiring them separately to avoid overloading the headlight circuit. Our kit provides you with a switch, relay, universal wiring harness and general instructions for installation. The kit is not intended for any particular application, but is easily adaptable to any motorcycle. TM-005: See your Street Glide or FLHT in a whole new light! 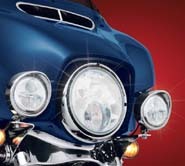 This aggressively styled halogen driving light kit gives the traditional “batwing” fairing an entirely new personality. Compact, stretched bezels and stylized fully adjustable brackets provide a clean, stiletto sharp look with intense, focused light output. The H3 bulb puts out a serious beam of light with lots of options. The complete kit includes everything needed to bolt them on and plug them in. TM-005 includes Bullet Style turn signals. Fits: 97 - current Electra Glides, ’06 - current Street Glides, & ’97 - current Road Kings. TM-029: Glassy black. See your ride in a whole new light. 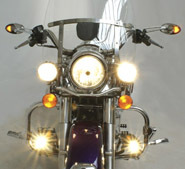 This aggressively styled halogen driving light kit gives the traditional "batwing" fairing an entirely new personality. Compact, stretched bezels and stylized fully adjustable brackets provide a clean, stiletto sharp look with intense, focused light output. The H3 bulb puts out a serious beam of light with lots of options. The complete kit includes everything needed to bolt them on and plug them in. Fits: 97 - current Electra Glides, ’06 - current Street Glides, & ’97 - current Road Kings. 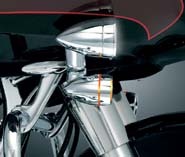 TM-007: Now Road Glide owners can also enjoy the darkness-melting power and sleek styling of these Driving Lights. 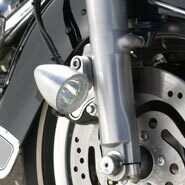 This kit’s unique bracket configuration allows placement of these compact lights in the same location as the stock turn signals and also permits full adjustment. Besides being tucked in neatly right next to the fairing, even the wiring is neatly concealed – just plug and play! Fits '98 to current Road Glides. FM-08: Here’s a slick way to add auxiliary lighting to the front of your bike! These sturdy investment cast brackets mount securely to the front fender bosses on your lower legs & neatly mount the sleek 3” diameter driving lights. The mounts allow for easy vertical & horizontal adjustment to direct additional light exactly where you want it. The lights use standard, readily available 35 watt H3 bulbs so finding replacements or upgrades is no problem. Includes complete wiring harness. Light up the night with our slick new Frame Mounted Driving Lights. These luminous lights use a 3" diameter streamlined housing with super white H3 bulbs that provide extra light where it's needed most. Light can be mounted virtually anywhere on the down tubes & can be adjusted with ease. Increase your visibility to others without compromising the style & function of your ride. Includes hardware and wiring kit. FM-16: For 1-1/8" & 1-1/4" Bar (pr) Requires 3/4” clearance around tube by 3/4” straight tube length for mounting. FM-17: For 1-3/8" & 1-1/2" Bar (pr) Requires 3/4” clearance around tube by 3/4” straight tube length for mounting. DOT and ECE compliant. Mounts sold separately. Show Chrome. DL-092: Similar to above but in Gloss Black. 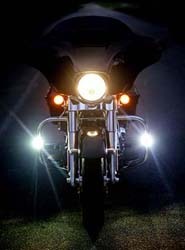 DL-35: Increase your motorcycle's visibility with 55/60-Watt Halogen Driving Lights. This light set is made specifically for larger motorcycles. The stylish bullet shaped housings are chrome plated steel, lenses are impact resistant Lexan, and they have replaceable 55/60 Watt Halogen bulbs which have blue tint when off but deliver an extremely bright white light when on that really lights up the road. Each light housing mounts on a swivel clevis with 3/8" studs. These are a “serious” set of driving lights, designed for today’s larger high performance motorcycles. They will greatly improve your motorcycle’s visibility to oncoming traffic, both day and night as well as your ability to see much further down the road and to the sides of the road. They can be switched on and off with a separate switch and from hi to low using your hi/low beam switch. They also feature a smaller 5 watt bulb which is left on at all times while riding (this is mandatory in many European countries) for increased safety with minimal battery power draw. The glass lenses are designed to deliver a spot beam on high and a broad flood light on low. 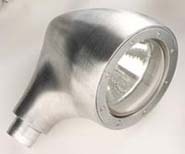 The housings are triple chrome plated steel and have a subtle integral visor at their tops. Includes detailed wiring instructions for easy installation on any motorcycle. Sold in pairs (Requires the use of 2 relays, sold separately). Bulb size 3.5", housing size 4.0". SK-126: An easy solution for connecting driving or fog lights that do not come with a wire harness by offering their wire harness kit without lights. This Universal Wire Harness comes with two illuminated rocker switches allowingyou to choose from either the rectangular ½’’ x ¾’’ cut out switch or 7/8’’ round switch. A wire harnesses known for providing protection to the vehicle’s electrical circuit by including a separately fused power source and isolationrelay, making this wire harness kit truly separate from the vehicles electrical system. With Relay & 2 Switches, 12 Volt Universal Application. SK-202: We make it easy to wire your new driving lights the right way. Eliminate the risk of overloading & damaging existing circuits on your bike by adding this independent fused relay circuit to power your driving lights or other accessories. Available with a super-clean handlebar mounted push-button switch or a self contained rocker switch - these kits make it easy to power-up your lights whenever they’re needed. Universal 12V Electrical Systems-Fits 7/8”, 1”, or 1-1/4” handlebars. SK-328: When using Halogens as additional driving lights, we strongly recommend wiring them separately to avoid overloading the headlight circuit. Our kit provides you with a switch, relay, universal wiring harness and general instructions for installation. This kit is not intended for any particular application, but is easily adaptable to any motorcycle. SK-207: Constructed of cast aluminum and finished in a high luster chrome. The two push button switches have red LED’s indicating when your accessories are on. Switch Block can be mounted to 1” handlebars on either left or right side. On/Off/On. Operates one accessory or another, not simultaneously. Momentary On/Off/On. Operates like a power window switch. 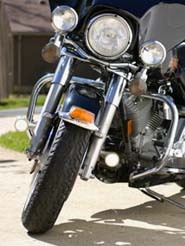 YV-161: Fog Lights with Daytime Running Light, for the Yamaha Star Venture & Eluder. Dramatically increases the brightness with the use of better LED's and reflectors over the stock or accessory. The YV-161's also have added a day time running light within the fog light assembly through a splice to the key switch circuit, so when the fogs are turned off the day time running lights are still on. Utilizing the onboard OEM switch and switch wire harness makes the fog light portion a plug-n-play with the included relay to complete the install process. These fog lights are both DOT and E-mark approved and deliver 6000K light.